At the conclusion of this semester’s classes, I’ll be turning my attention more fully to the Lewis research that you’ve been seeing in fragmentary form here. One of the things that fascinates me about Lewis is the degree to which one can understand him as a continuator/tradent of the Lipscomb-Harding theological synthesis among NI churches in the 1950s/60s. But Lewis was not alone. Several other figures from a younger generation (relative to Lewis), to a greater or lesser degree, also fit this description. Interestingly, several of them can also (like Lewis) be found in North Alabama. Over the next couple of posts, I’ll be looking at one of these figures, Irven Lee (1914-1991). At the request of John Mark Hicks, I’ll offer here a few thoughts, historical and theological, on Lee and his “Friendly Letter on Benevolence” (1958). Cleve and Zula Lee were married in Calloway County, Kentucky, in 1910. Soon after their marriage, the couple headed to southwestern Arkansas with a large group of friends and relatives to homestead an allotment of federally owned land. Their time there, their son would later recall, was one in which they “were well acquainted with poverty and hard work” (Preaching, 11). Their only child, Irven Powell Lee, was born near Wilton, Arkansas on 26 July 1914. About a year after his birth, they returned to Kentucky and settled in Calloway County to work a farm between Murray and Hazel. Much of Irven’s early life was spent on that farm, splitting his time between farm work and schooling. Even though his parents had not had the benefit of a lengthy formal education, they wanted this for their son. After he completed the eighth grade, his parents sold their farm and moved into town so that Irven could attend Murray High School. They were not, during Irven’s childhood, religiously observant (although he recalls that they were “members of the church”). In Murray, however, Irven started to attend the Water Street Church of Christ with a friend. He was baptized there by noted itinerant evangelist Horace W. Busby in 1928. He came of age as the Depression set in. Given his family’s socioeconomic status it is perhaps surprising that a college education was so readily available to him. Yet, the State of Kentucky, in the early 1930s, responded to the Depression by offering free tuition in its state colleges, in an effort to keep young men out of the labor market. Taking advantage of this, Irven was educated at Murray State Teachers’ College and David Lipscomb College (1930-34). In his autobiography, he recalls that he took almost every Bible class offered at DLC and no academic courses (completing those at Murray). He writes, “H. Leo Boles and S. P. Pittman taught those Bible classes and were a great help to me” (Preaching, 18). Upon graduation in 1934, he undertook studies in the School of Religion at Vanderbilt University (this was the predecessor of the current Divinity School), focusing on church history. While a student at Vanderbilt, Lee had started teaching part-time at the David Lipscomb High School. Then, after graduating from Vanderbilt in the fall of 1936, he moved to Valdosta, Georgia, to accept a job as the principal of the Dasher Bible School. He spent five years there overseeing the school and preaching for the Dasher church, five years that inaugurated a period of nearly twenty years of teaching and school administration alongside his preaching commitments. Following his departure from Dasher, Lee became, in 1943, the first president of the newly formed Athens Bible School (Athens, AL). He served in that role for five years before accepting the presidency of the newly formed Mars Hill Bible School (Florence, AL) in 1947. His stint at Mars Hill was his last as the president of a “church-affiliated” institution. His relationship with these schools was complicated as time went on — on two counts. 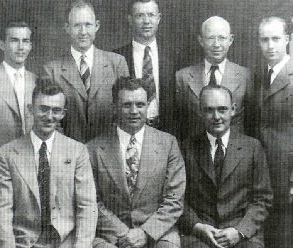 As Churches of Christ came through World War II and into the 1950s, two issues occupied the churches above all others: 1) the question of Christian participation in government and in military service, and 2) the question of congregational support of parachurch organizations like colleges, benevolent societies, and orphans’ homes. More of that in my next post. “During the years of teaching and since, I have spent much time in working with more than thirty congregations in their beginning days….Good health allowed me to be about my work every Sunday from my first preaching in 1931 until May 1974, except in 1949 when mumps kept me out of the pulpit one Sunday” (Preaching, 21). “There are a few little firmly established churches in the Jasper area that are dedicated to the safe way. Good men preach in these communities. I do not know how Gus Nichols could have done more with the tongue against these churches than he has done, but he has not been able to prevent their starting and growing. The future will be brighter” (“The News Letter Reports,” Searching the Scriptures 9.2 [February 1968]). Lee notes that this had largely abated by the 1970s (as it had in other parts of the country) as mainline conservatives like Nichols turned their attention to the rise of “liberalism” in their own fellowship and as non-institutional leaders turned to deal with internal conflicts and with the process of rebuilding in the wake of the split of the late 1950s. Following a heart attack in 1974 that halted his regular preaching work, Lee turned to writing. Out of this period came the publication of Preaching in a Changing World (1975) and Good Homes in a Wicked World (1975). Other books followed: God Hath Spoken (1979) and Things that Make for Peace (1987). He died in 1991. *Sources are comparatively fulsome. First and foremost, there is Lee’s autobiography, Preaching in a Changing World (Cogdill Foundation [? ], 1975), referred to in this article as “Preaching.” Additionally, there are numerous articles from Guardian of Truth/Truth Magazine and Searching the Scriptures, as well as a biographical entry in Preachers of Today, Vol. 1 (1952).